A few months back, dbatools wizard Fred created a prompt that was so awesome, I never had to use Measure-Command again. It was cool enough that a number of us ended up adopting it, so I figured I’d share. Performance is important to us so that’s what the prompt is all about. Nothing fancy, just the current working directory and how long the command took to run. As you can see in the screenshot above, the first time Get-DbaDatabase runs, it takes 740 ms. This is because we’re caching the database names, login names, and some other auto-populated variables in the background. When the command runs again, it takes a more reasonable 110ms to complete because it is not performing any caching. Want this prompt for yourself? Here it is. Just notepad $profile, paste this in, save and restart your console. Note that you may have to restart ISE twice if you’re using the ISE. Thanks, Fred, for all the features! I’m not seeing a link or any code for the custom prompt. 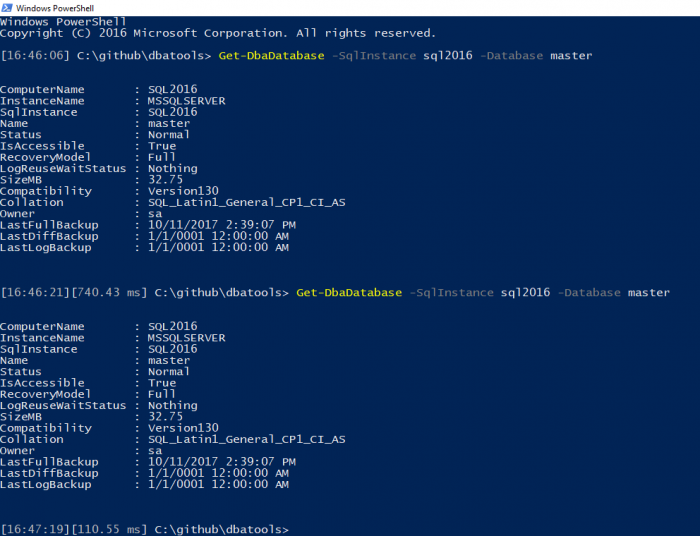 Hi Chrissy, my output of GET-DbaDatabase is different from your…Why is that? Properties like Lastbackups are not included in my output. 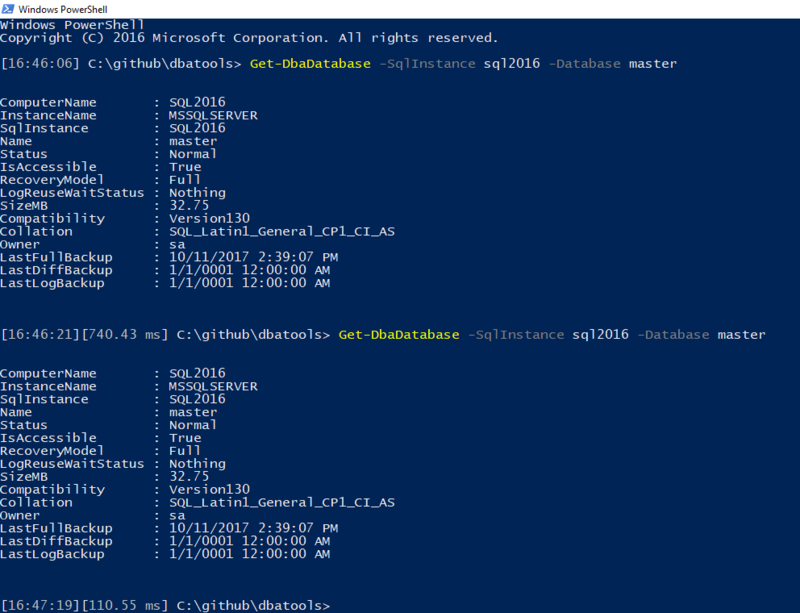 If you loaded the SqlServer or SQLPS module first, it will overwrite the settings for the Database “type”. Try from a fresh prompt without loading that module. Chrissy, I really like the prompt, but I implemented into ISE and I could no longer open files. Any ideas why? Hmmm, tried applying it a second time. This time I can open files. Not sure what happened the first time. Happy to hear it worked! I’ll add that suggestion to the post, that a second restart of the console may be necessary. Thanks for the Blog, the Tools and support; very worthwhile and helpful. Avid dbaTools user. Havent got the fancy DbaTimeSpanPretty so hacked your code a bit. Very cool, thanks for the share! You should tweet a screenshot too. People love useful prompts!